Postural correction and changing posture. Can we treat our patients like puppets? Audience: Therapists and Strength CoachesPurpose: To justify the use of a variety of exercises (even general exercises) for training, rehabilitation and injury prevention and question the application of movement specificity principles. The Gist of this Post: Specificity of training is an important component of rehabilitation and strength and conditioning but I think the application of specificity can be taken too far when we attempt to mold our posture. A related post by Tony Ingram touches on many of these ideas in relation to pain and posture. "Evidence supports exercise-type specificity; the greatest training effects occur when the same exercise type is used for both testing and training. Range-of-motion (ROM) specificity is supported; strength improvements are greatest at the exercised joint angles, with enough carryover to strengthen ROMs precluded from direct training due to injury. Velocity specificity is supported; strength gains are consistently greatest at the training velocity, with some carryover. 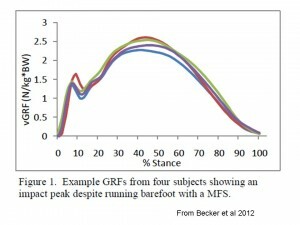 Some studies have produced a training effect only for velocities at and below the training velocity while others have produced effects around the training velocity"
"It has been suggested that training at a specific velocity improves strength mainly at that velocity and as velocity deviates from the trained velocity, the less effective training will be. 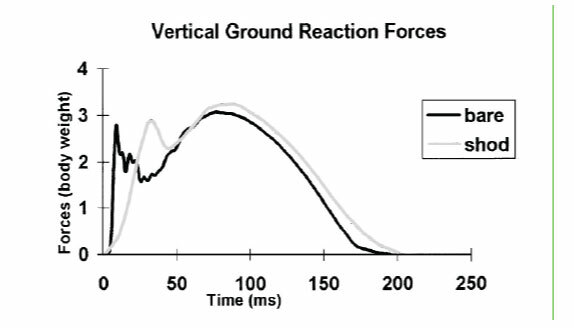 However, the research describing velocity-specific adaptation and the transference of these adaptations to other movement velocities is by no means clear". 1. 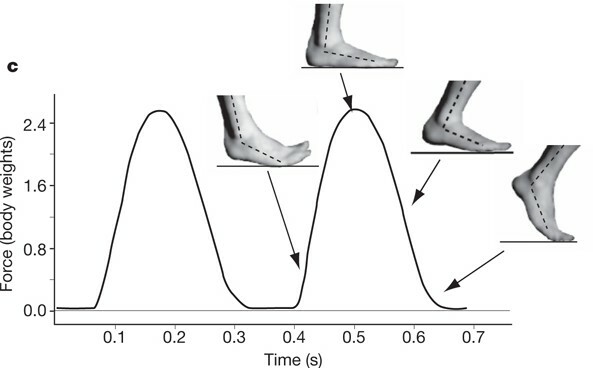 The repeated performance of an exercise leads to plastic deformation of tissues or changes in motor control that cause significant changes in posture and movement capabilities (aka form). I question if the body is really this malleable and ahem, stupid. It assumes that consistently training certain movements makes you move in that specific way and you lose the ability to move in other ways (i.e. your posture and form become changed). I believe it is an inappropriate extension of you become what you train. It is a training belief related to the idea that hip flexors become shortened because we sit all day (see a previous post here). I don't doubt that you can train habits of movement that might carryover into other tasks. What I question is whether are tissues are so readily plastic and they can't control their destiny because of some passive changes in the make up of the tissue. I was listening to a podcast where the speakers objected to what they felt was the rampant, unjustified, often silly and apparently detrimental usage of the front and side plank (bridge) by physiotherapists and trainers the world over. What the speakers argued was that performing these repetitive planks with no motion between the hips and the thorax would somehow create runners that will run like robots and lose the ability to dissociate the hips from the thorax. As if twenty minutes of planking a week will somehow carryover to the automatic movements that occur during running. I just don't buy this and consider it such a pessimistic and wholly unfounded structural view of the body. It assumes that the body is stupid and a few minutes of planking will somehow override what ever neural control mechanisms, not to mention physical forces, that create subtle movement in the spine when we run. 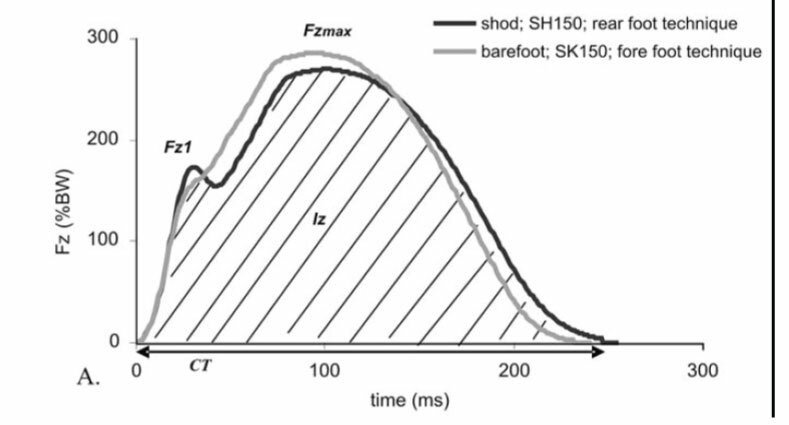 A brief review of 3D spine kinematics during running can be found here (Schache et al 2002 ) and here (Saunders et al 2005). We don't change form through simple exercises...or do we? The belief that planking makes you rigid and run like a robot has not been tested but assumes that planking will somehow stiffen up all the muscles of the trunk within the neutral zone and also cause our brain to change the automatic way in which it recruits muscles during locomotion. That is some powerful planking to override our nervous system like that. 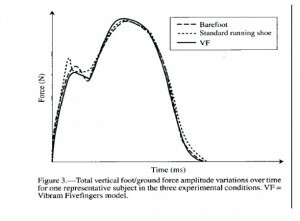 It is very difficult to change running kinematics even when we try to change running kinematics by volitionally changing our posture. But somehow, a little bit of planking can do this despite us trying to run normally. BUT...to weaken my arguement (and engender some healthy doubt or hope :) ) there are some papers that do show a change in posture albeit inconsistent. 1. 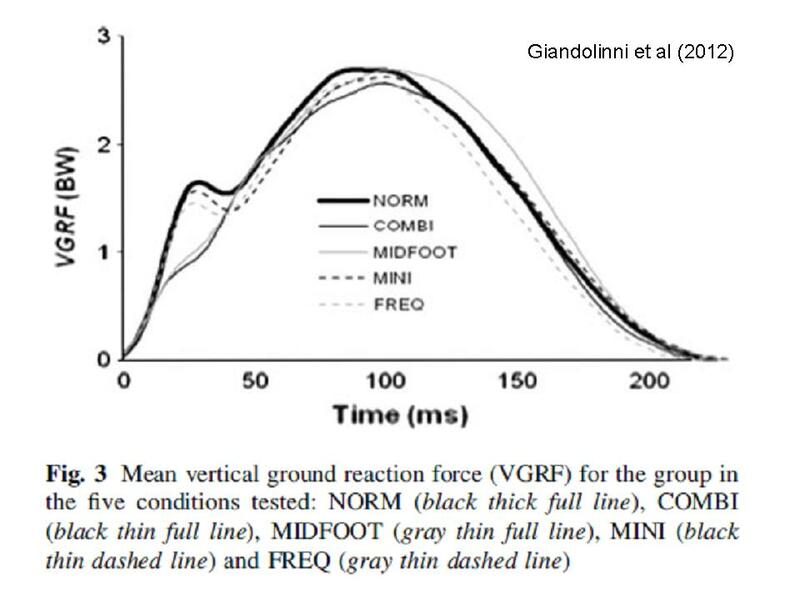 Here is a great paper by Scannell and McGill(2003) - Stu does all the great stuff! There were no changes in the size and location of the NZ of each group recorded during the mid-training and posttraining tests. 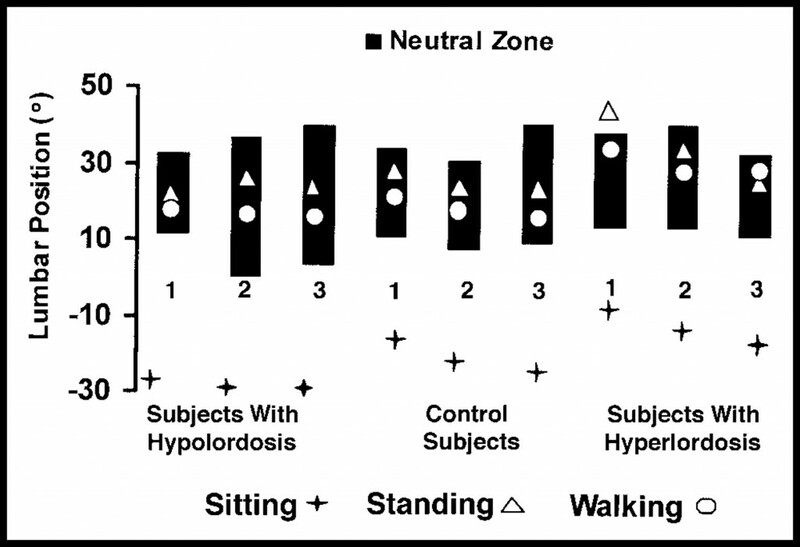 Above Figure Description: The changes in the neutral zone (depicted by the black bars) and the lumbar position during sitting, standing, and walking (50% level of the amplitude probability distribution function) across the pretraining test (1), mid-training test (2), and posttraining test (3) are shown. 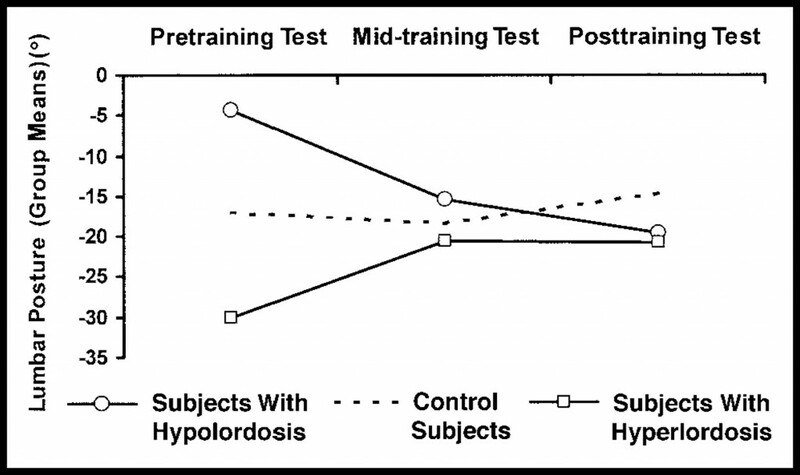 The subjects with hyperlordosis stood in less lumbar extension during the mid-training and posttraining tests. Subjects in all 3 groups sat in more lumbar flexion during the mid-training test. No changes in the lumbar spine position during walking were found during the mid-training and posttraining tests. Positive values greater than the neutral zone represent extension. The Scanell paper certainly shows a change in resting posture (e.g. lordosis) but we see no change in lordosis during functional activities nor is their change in the stiffness of the spine. This suggests that we aren't changing passive properties of the spinal tissues with these exercises but we are doing something else to change resting posture. Did the participants change habits while doing the exercises and became more comfortable standing in a more neutral posture? Was their standing posture a choice? What I take from the conflicting research is that if there is a change in form with basic exercise it is not robust nor is it consistent. And there is not sufficient information or even biological plausibility to assume that doing the plank daily for 3-5 minutes will somehow result in all of us moving like robots during an activity like running which appears governed by more central patterns. I can't even imagine trying to run with a non-moving spine. 2. Misconception #2: Exercises must be specific in terms of every variable to be considered "specific"
This happened to me when I was trying to publish a paper on strength and conditioning for golf and I had the pickiest reviewer who kept saying that none of the exercises I was advocating as being specific to golf (e.g cable chops, one arm cable punches/pulls, weighted swings, med ball rotational tosses, Swing fan swinging) were specific to the golf swing as they all either had slightly different mechanics or different speeds. I believe that I asked if a weighted sled exercise was specific to running and I was told that no it was not. I just think it is realistic to assume that a definition of specificity recognizes that some differences in terms of velocity or kinematics is acceptable and that we will still get benefits in the task we want to improve. The early papers mentioned by Behm and Sale and by Cronin et al certainly support this. 3. Misconception #3: Non-specific or general strength exercises can't carry over to performance/injury reduction for specific tasks. This is essentially the opposite of number two. It is a pretty big debate and would rear its head with those arguing for functional exercises versus non specific exercises. You could also ask "Are specific or functional tasks always better than general exercise?". MOst of the time people assume (myself included) that specific tasks are better but I think we would ignoring a lot of research that suggests otherwise. A specific example can be seen in respect to doing a plank exercise for a runner. Obviously, no runner gets into this position. It is not specific in terms of body position with respect to gravity, the movements of running and certainly not velocity. So the knock against this exercise is that it is not specific to running and therefore can't help the runner. And I say, who cares? Why does it have to be specific to running? Can't an exercise give us benefits that carryover to other tasks? Of course they can. The plank obviously trains the trunk muscles and the lateral hip muscles. We know that many runners with pain have weak abductors (whether this is a cause or correlation is hotly contested) and at the same time we have some evidence to suggest that training the hip musculature (with exercises that are nothing like the running movement) can be effective in returning people to running and decreasing pain in those with knee injuries. In terms of performance, I am biased, I do like creating exercises or stealing them that are somehow specific to the task at hand. However, I recognize that there is a great deal of research that shows that exercises that are not specific to the sporting task can still improve performance (e.g. squats for sprinters). Again, arguing that specificity is not always necessary. My main point is the body craves variety and our programming and rehabilitation should reflect this desire. We don't have to be so rigid in our prescriptions or believe that there is only one way to get benefits. The body adapts, lets exult in this. This post is a bit of a jumble with a lot different ideas. I have few posts written half-assed in my head that are related. If anyone wants to write any of the following with me please let me know. Or stay tuned for these upcoming posts. These posts will ideally be a gathering of information that generates questions. 1. A catalogue of exceptions to the Joint-by-Joint Approach. This post will use the framework of the joint by joint theory to consider the research that looks at injury risk factors. It is not so much a critique of the approach but more a means to understand it limits and explore how it can still be useful. 4. Can form be changed with via mechanical changes in tissue? 5. 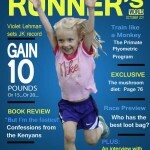 Changing running form through feedback and training.